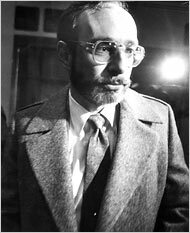 On October 23, 1998, an anti-abortion assassin murdered Dr. Barnett A. Slepian in his home. Dr. Slepian was an obstetrician-gynecologist who included abortion as part of his practice in Buffalo, N.Y. Dr. Slepian performed abortions because he believed it was necessary for women to have a choice when faced with an unintended pregnancy. He remembered when women died from unsafe, illegal abortions. When the anti-choice terrorists could not succeed politically, they resorted to acts of terror and intimidation to eliminate choice. Anti-abortion extremists targeted him for years of harassment. In spite of the threats and harassment, Dr. Barnett Slepian courageously stood up to these terrorists and continued to provide complete reproductive health services to women until one of the terrorists shot and killed him. The Barnett A. Slepian Memorial Fund, Inc. The community that suffered the loss of one of its best physicians established a memorial fund in Dr. Barnett Slepian’s name so that his work can live on. The fund is intended to provide training grants to physicians and medical students who are committed to include abortion in their medical practice, who view the option of abortion as an integral part of comprehensive care for women, and who refuse to allow political and religious extremists to dictate patient care. Increasing the number of providers will reduce the risk to any one physician. A grant award may be used in any manner necessary to support a physician, resident or medical student’s training in the abortion procedure. For example, this grant could assist with training fees/tuition, living expenses while in training, or travel expenses. Applications are reviewed and awards are made on an ongoing basis. We are currently accepting applications.